(VOVWORLD) - Visitors wandering Hanoi’s Old Quarter streets at night are treated to beautiful sights and sounds, of performances featuring both traditional and modern music. These street shows have attracted more visitors to enjoy the exciting, yet unique atmosphere of the area. Strolling along the narrow streets of Hanoi’s Old Quarter, visitors can find performances of ceremonial singing (ca tru) at Kim Ngan temple in Hang Bac street, xam singing (blind busker's singing) at Dong Xuan market, or chau van singing (ritual singing) at the corner of Ma May and Luong Ngoc Quyen streets. In front of Hanoi Ancient House at No. 87 Ma May street, if you’re lucky, you can catch a local band playing melodic tunes. At Huong Tuong temple not far away, a ceremonial singing performance has attracted a big crowd of visitors. "Since they began such musical performances here, I’ve never missed a single show of ritual singing as I love this art genre so much. I find these live performances by professional artists much more interesting," said Le Thi Huong of Hanoi’s Dong Da district, who is among the audience. Artists can sing and perform at the audience’s request while the audience can take part in the performances. "I have attended many such folk music performances in Hanoi’s Old Quarter. The shows were very impressive and attracted many, many foreign visitors in the audience. They took photos and even filmed all the performances. This is a great way to promote our culture to the broader world," said Nguyen Nhu Hieu of Ben Thanh Travel Agency. 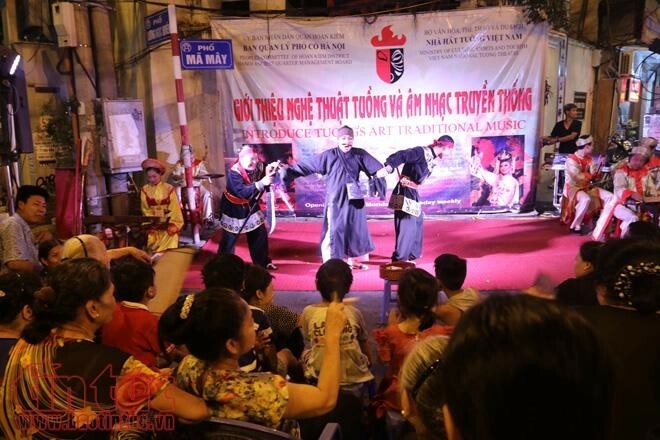 Art and music performances have been staged for free in Hanoi’s Old Quarter every Friday, Saturday and Sunday night, by groups of both professional and amateur artists, with the hope to further promote Vietnam’s traditional arts to local and international visitors. "We always try to stage shows of different genres of music and arts on different nights, to make them fresher and more attractive to the audience. 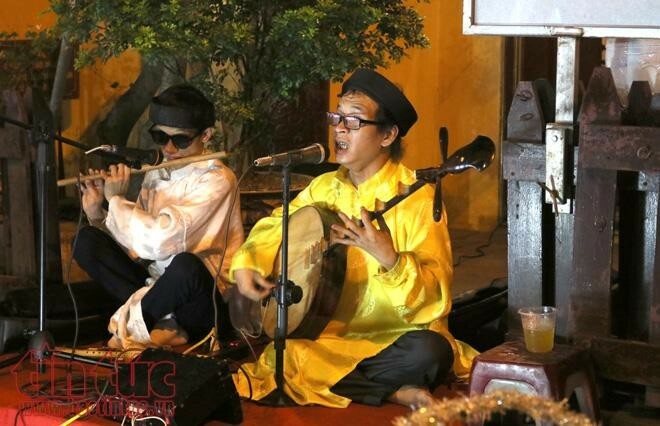 Ceremonial singing, ritual singing or blind buskers' singing will take turns to be in the spotlight on each night," said Tran Thuy Lan, Deputy Head of Hanoi’s Old Quarter Management Committee. These melodies are more passionate when performed in the Old Quarter of Hanoi, a city with more than a thousand years of history.